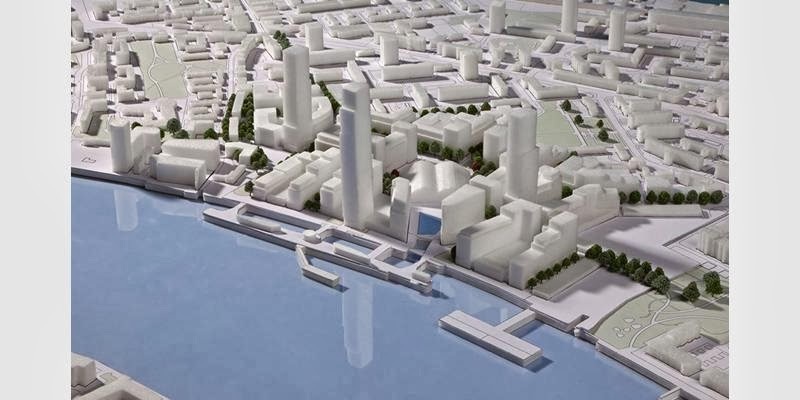 The plans by Hutchison Whampoa to redevelop the former Royal Dockyard site on the Deptford riverfront at Convoys Wharf have been widely criticised. Essentially they offer an identikit riverside tower block scheme with cursory social housing and little reference to the site's rich history, not to mention a huge impact on the local transport, health and education infrastructure. Lewisham Council has been considering the latest planning application since a revised Masterplan was submitted in May 2013. Now even the limited influence the community has through the Council's planning process has been taken away by London Mayor Boris Johnson. As revealed in Building Design today, Johnson has 'called in' the project, which means that he will decide if it goes ahead rather the local Council. As the headline in Building Design makes clear ('Boris grants developer's wish and calls in £1 billion scheme'), this follows lobbying by the developer who claim that Lewisham has been dragging its feet for five years. Strange as the developers made a big point that they were offering something new and refreshing when they put in the lastest plan less than six months ago - though as Deptford Is... explains there is little to choose between the 'new' Farrells masterplan and the previous Aedas masterplan. Both 'proposed 3,500 homes, three towers above 32 storeys, 2000+ parking spaces, shops, a hotel, some green space, and a nod to the history of the site'. Whether there is any connection between Johnson's decision and his recent courting of Chinese capital is unclear. The developer is a Hong Kong-based company with a history of business interests with Convoys Wharf's previous owners, News International. The latter's Rupert Murdoch is of course another mate of Boris. The years of phoney war about Convoys Wharf may soon come to an end, with Johnson likely to try and push through the plans in spite of local opposition. Campaigners for preserving the site's heritage as a ship building site and a garden have been effective in raising these issues, but there are also wider concerns at stake which will impact very directly on everybody living in the area. Fundamentally its about whether the site is developed in a way which responds to the needs of local communities, including low cost housing, or whether this critical site is turned into a dormitory for the very wealthy - with most of the flats no doubt snapped up as a property investment by people who never live there and have no interest in Deptford. The day after Lewisham Council win against Hunt and the DoH in the Court of Appeal? Co-incidental? This being the conservative party that was going to give local people more power over the planning process? No disrespect but I think he is totally correct to get involved as this project has been stalled for 13 years. The area DOES need regeneration and I do hope that Sayes Garden is built as a priority too but have serious reservations about the Lennox as there is a big ship in Greenwich that you might know already. Are we going to have big replica ships everywhere? I think the Garden is a perfect choice. I am not totally anti lennox but think its down the list. I would like to see the ship building project, but for me the major concern is the loss of an opportunity to create affordable housing when there is such a shortage of it. And Boris Johnson is the last person I would trust to guarantee that. A far better solution would be something like Coin Street on the South Bank where good quality social housing was created right next to the river following a concerted local campaign. Of course the landowners seem to hold all the cards, the former public land having been sold off at a bargain price to News International in 1980. But the Mayor does have the power to determine what gets built there, including levels of social housing. Of course he has already relaxed these limits, but that is a political choice not an inevitability. It's a massive exaggeration to say 'the project has stalled for 13 years'. Current owners only bought the site 5 years ago, and it is less than six months since they submitted their revised planning application.